The other day I begged asked for the help of my dear bloggy friends. Y'all certainly did not disappoint! Thanks for asking me your burning questions. Not only was it nice to hear from you, they were fun to answer. This installment discusses running, adoption, and hair products. It's like a buffet, a little something for everyone. The next installment (coming soon) will answer the remaining questions. Alison got us started with questions related to running. Who's training schedule do you use for your half marathons? For the past two years I followed a plan from a local branch of USA Fit. Their schedules are great for beginners because they build miles up slowly. This season I am running with a different local group and following one of their plans for to get ready for the Marine Corps Marathon in October. I like Hal Higdon's plans too, though I have not used them. It's comforting to know they are out there though if I need them. What do you typically run per mile? Okay, this is like asking a woman her age or her weight, but ... No, seriously, I have no shame. My pace varies, but it is usually around 11:30 -12:30ish. Sometimes less (woohoo), sometimes more (whatever). In cooler weather my pace picks up. I usually follow a run/walk interval of 5:1. Jeff Galloway is my hero. Do you lift weights and cross train like the schedules tell us to? Sorry, I just had to pick myself up off the floor after laughing myself silly. Um, no I don't. I know I should and probably could, but I don't. Do you run better in the morning or afternoon? Definitely morning, once I get into the routine. It's so hot and humid here in TX, the wee hours of the morning are the most forgiving this time of year. I also feel better knowing I got my run in early and it's not looming over me, taunting me. Viv asked Which marathon race are you planning for this year? I am training for the Marine Corps Marathon in Washington D.C. October 26th. I am nervous, but also excited. I will also do the Aramco Houston Half in January. I'm not registered for anything else right now, but I'd like to do a Half every month or so this spring. Jen asked about my running routine and running with Annelise. I try to run 3-4 mornings a week, then a longer run on Saturday mornings. During the weekdays I leave for my run before Scott and A. get up, then get back by the time he leaves for work. On Saturdays I leave while the family sleeps and when I get back everyone is ready for breakfast. In cooler weather we'll go out as a family and Scott will walk with Sadie (our dog) and A. will ride her bike or scooter. If I don't run outside, I take A. with me to the YMCA. She plays in the child center and I'll hit the treadmill. Autumn and Jen wanted to know more about my running skirts. Hands down my favorite running skirts are from SkirtSports. The Gym Girl Ultra to be exact. They have bike shorts under the skirt. They are more of an investment $$ wise, but the shorties stay where they're supposed to, no worries. I also have worn the Champion brand from Target, which is easier on my wallet. They are nice too, but the shorties creep up my thighs. That drives me nutso and can completely bust my running groove. If I really have a running groove and all. Running Knitter asked What do you suggest for pre-race or pre-long run meals? What do you eat (if anything) on your long runs? It's hard for me to eat a lot before a run. Not much sounds appetizing in the wee hours of the morning. I don't eat before weekday runs, just before the longer Saturday runs or races. I usually eat either a whole wheat English muffin or cinnamon raisin bread with almond butter, or a Kashi chewy granola bar or half of a Clif bar. If I know I have to be up really early for a race or long run, I might eat a later night carb snack. During a run I supplement with either Espresso Love Gu or Clif Shot blocks. If there are snacks along a race course, like cut oranges or bananas or pretzels I will nibble on those. Kacey asked, How much did it cost to print your blog book? I think it was in the neighborhood of $90. I did get a hardbound book with the image wrap, so that increased the price. Plus it was a whopping 350 pages. Considering what I might spend on scrapbook materials, photos, etc. to make a scrapbook of a year and a half I figured it wasn't too bad. Motherhood for Dummies asked, What brought our family to Texas? I wish I had an interesting answer for you, but I was born here is all I've got. So was my husband. We built our house on the same street I grew up on, and my dad still lives two houses away. Pretty deep roots. But who knows what the future holds, right? Rhonda and Jen had questions about our international adoption. Why did you choose to adopt in Russia vs. China? During the time we were dealing with fertility struggles, there was a family at our church that had adopted their daughter from Russia. They were a big support to us since they had gone through IVF and adoption. At the time, we felt like we wanted the adoption to be as seamless as possible and for the child to be able to blend in easily to an American family. That way she can choose to tell people, or not. She knows she was born in Moscow and was adopted. One of her favorite things to do is look at her baby book (she calls it her Russia book) and hear her story. We accepted the referral and started making the preparations to travel to Moscow to meet her. We had to wait for court dates, visas, etc. We made our first trip to meet her in late October 2004, stayed about 4 days. Two weeks later, in mid-November, we made the trip again to finalize everything and bring her home. 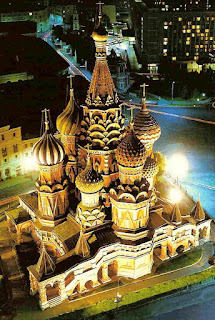 We spent about a week there in a hotel in Moscow, but she was with us--and we were suddenly parents of a 14 month old. Highly amusing. Pros and cons? We had a positive experience overall, which I attribute to God's hand working through everything. Thankfully we had no delays or roadblocks. The only con might be the travel overseas, twice. We didn't see it as a con though because those long airplane flights brought us to our daughter, and brought our new family of three home. How long was the process? Again, this was a God thing completely. From the start of the paperwork, home study, oodles of official documents, getting a referral (her video) to bringing her home was 8 months. Rhonda and Autumn were curious about the hair products I use. 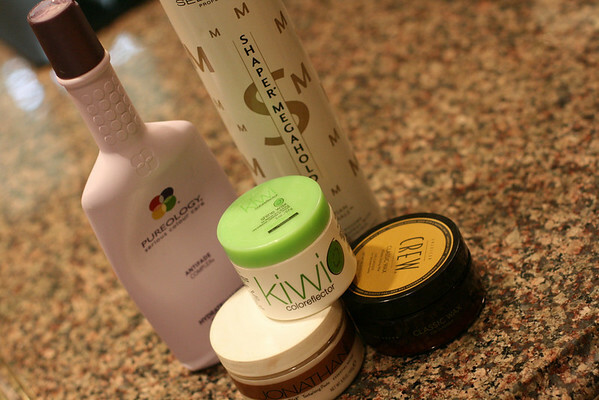 Do you use mousse on your hair? I use a gel sometimes, but I am hooked on wax. What brand shampoo, hair products do you use? 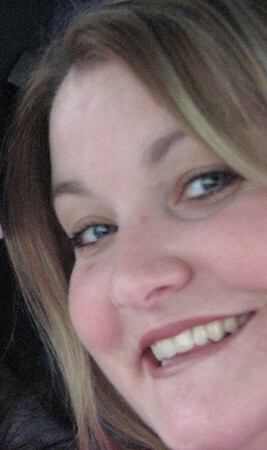 I've been using Pureology shampoo in the hopes of keeping my color and highlights from fading. I don't know if it really helps, but it smells pretty good. This short, spiky haircut has been perfect for summer. I have not picked up my blow dryer in weeks! No flat iron! I just run some gel through it or work in some wax and I'm set. I have been experimenting with three different hair waxes, but not all together. Waxes help piece out/ chunkify your hair and they hold really well. It's important to remember though a little goes a long way, otherwise you are left with a greasy mess. Whew! That's it for Installment #1. Let me know if I was as clear as mud on anything and I'll try to answer you better. There are still some questions left. I'll post my answers to those soon. Thank you again for playing along! That was a great post! The MCM I have heard so many wonderful things about that marathon. It will be fantastic! Thanks for answering! I loved getting to know you a little better! I loved learning more about you! I can imagine how your hearts were beating out of your chests when you popped that VHS tape in of your little girl! She has the most beautiful eyes, too. I loved how you worded your answer about traveling over to Russia. God was definitely in your adoption and He had the whole thing planned out! AWESOME QA I enjoyed reading! That was fun! Thanks for answering. I love that pic of A. from the video. I can't even imagine how it must have felt to see that video of your future daughter. It must have been surreal. That photo of your daughter is priceless! Oh my goodness...I have the chills. Adoption is the greatest blessing! Whew, I was feeling bad about not cross training/doing weights and was thinking that was my problem, though maybe it is. I may have to look into this Jeff Galloway person. I would see the traveling for the adoption as a plus. The photo is too sweet, with those big blue eyes. love the part about the adoption. the running skirts also look interesting. I don't like the ones w/ the creeping bike shorts....definitely need ones that stay put! What a great post Holly. I love your adoption story! That picture of her on the screen just tugs at the heart. You were all meant to be a family - just took a little more to get there. That was so cool! I loved it all but especially the part about getting A. I remember hearing and staying posted on every step through H. It was a most wonderful thing and she is the luckiest little girl E.V.A.H. Of course, I think you are all pretty lucky to have found each other in such a "GOD" way. It truly was. I didn't realize that you had adopted too. Oh my I would of tried to be on the next plane trip over after seeing those eyes... She is so adorable. We have never adopted out of the country for the fear of it all & there are so many kids here that need homes. But I could never even see myself walking into an orphange. I know myself & would be absolutely sick thinking fo all those children left... Going to the humane society is sad for me. I cry when I watch the shows that show what the orphanges are like in other countries & I wish I could save them all..
Do you want to adopt more? Is it as hard as I have thought in my head? We are done adopting & having kids though. Love all your answers & questions. I really want to start running after reading about Jennifer H, she's such an inspiration & so are you! Ooh, I'll have to try those running skirts, been thinking about it. Good luck with the marathon training; I'm training for Chicago Marathon in oct.
this was great- i love learning so much more about you! I loved this post, loved reading all about your running adventures, so wish I could run (not an option, knee injury, or is that just my excuse, no its real). The story of your adoption process was amazing!!! Thought Id let you know I posted your hair!!! ha ha ha, you know what I mean, my hairdressers version of your hair!!! Just catchin' up on your blog, since I've been away-- love the question/answer thing! I hate to admit it.... but I quit going to WW a couple of weeks ago. Yep- I'm a quiter. Oh boy, what can I say? I didn't know A was adopted- I guess i'm too new to the blog or too dense- wow- what a great story. She is an absolute doll & how lucky for her to have two such wonderful parents and of course, you to have her! Adoption is amazing, i love the darling photo from the video- sniff, sniff she's sooo cute! Blurb- I was wondering how much it cost?- great question/answer. I really want to do that. My question... how long did it take you to get the year organized for printing?